ANY LEVEL RANGE! FASTEST EXP/HR! Fastest Paragon & Package Service Available! Unbeatable Reviews at the Bottom of the post! - Can you play when I sleep/work/study only? YES! We offer awesome support and will work on grinding your paragon whilst you cannot play. - How do you paragon level? We farm high level greater rifts, and leave all the good ancient legendaries for you. - I would like 850-1200, can you quote for this? Absolutely! We do custom quotes and they are very cheap if you have geared characters! - We have multiple people working from countries in Europe, such as Romania, Sweden & a few in Germany. 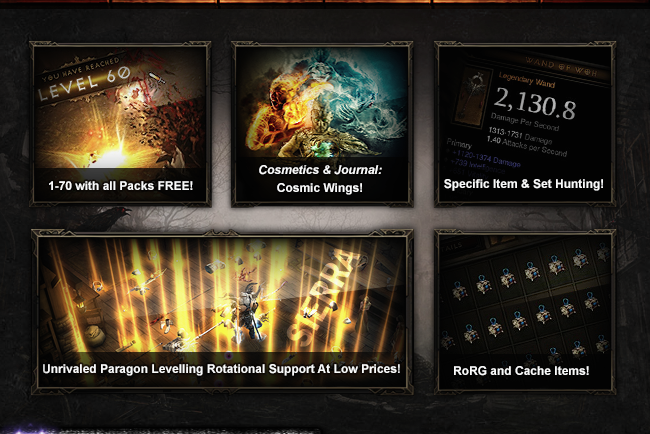 2) Re-Purchase the CD Keys, both Diablo 3 & RoS and provide to you. 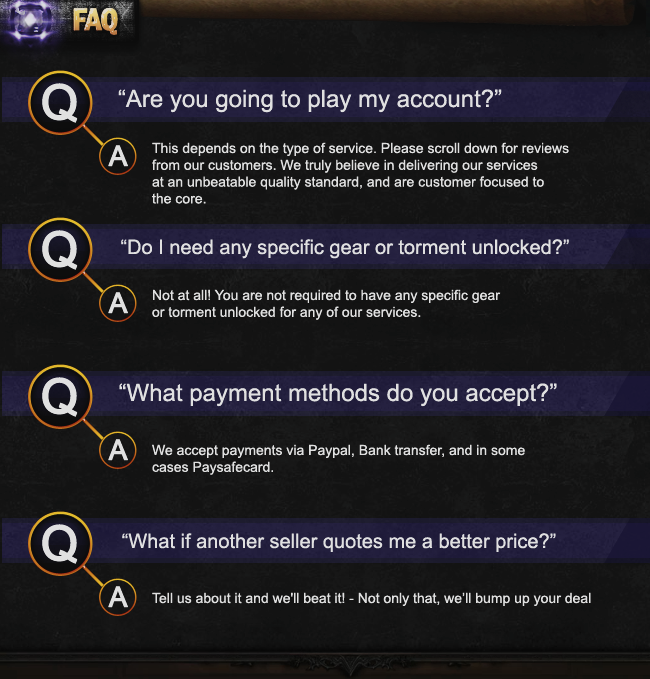 3) Offer to help with boosting (self-played) to assist. Be careful of imposters! Always check the Skype ID. We are the ones from Switzerland. Just click the button above to be safe. which can all be found in this thread. Go with us and let us satisfy you! added you on skype for some inquiry. Just started an order, so far so good. Will write up an overall review once the job is finished. They reply fast and their customer service has been on point as of right now. For anybody thinking of using Sierra's service, I suggest you create a separate account and friend your main account so you know when they are working on your order and when they are online. I've been able to monitor everything and they seem to work pretty consistently. I don't know how they do it but they seem to be getting things done so far. Will post an update/bump this thread as developments go on. I hired there service 10 billion exp+100 cache, i will update this post as developments go on. As of this morning which was approximately 8 hours ago, I counted about 8-10 unidentified legendaries in my stash with an increase of approximately 18 paragon levels from 207 to 225. I'm assuming this whole process takes a while for the guaranteed 50 but I think it's worth it for the fee. If these guys really pull through I may even tip them and use them again in the very near future. Ok after 24h, i logged in my account to check how things going, so far they farmed 7 leg, 0 caches and 17 Paragorn levels. Btw anyone interested in buying there service, should do right now, they are increasing there prices, because of high demand. Bought 10b service. They did it really fast and had like 15-20 legendaries incl. Shard of Hate. Love em. Highly Recommended. So my 50 leg order is about done, and it took approximately 2-3 days to complete. During this time I didn't really log on at all except on another account which friended my main account to see when they were really working on it. I gained approximately 30 paragon levels from 207 to 237 or 240. They accumulated about 50,000,000 gold, 500 blood shards, and more crafting mats than you could count. Although I didn't get anything like a TF, SoH, or the like, I did find a nice Stone of Jordan to complement my Royal Ring of Grandeur, a socketed Slorak's and a set piece for my wizard (firebird's). Overall their service is an A+ in my book. They can be hard to get a hold of during the process because they are so busy but I am not one of those people who constantly nags for updates since I can see when they work. I highly recommend these guys for those of you out there shopping among the various services. These guys are one of the few that are actually trustworthy with your account information and work very quickly and I am a first time customer with no ties at all to whoever is running the service. So if you are wondering if you should go for it, you should. The price is reasonable, they do what they say, and they are trustworthy. Need I say more? I ended up placing an additional order too. Look no further. That means alot, thank you Adrift! Add to Skype! We'll answer everything! Skype: killuchen Always ask me to post on your pages before dealing with me. A lot of impostors out there! It happened to me as well, but that's because he also eats/sleep so don't worry. I asked for 20bil exp which was fast and clean, he got me a lot of gold, legendaries and materials. 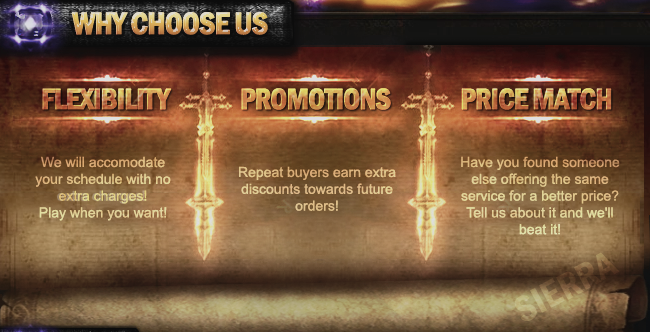 Decided now to order 30bil exp since the service is really great, recommended to everyone. Been trying to reach you on Skype for a week. Any secrets to getting a hold? If you need a job doing, contact ASAP, there are limited spots so please have some patience! As of now, we have spots and are free, so feel free to add me! Gogog! been on and off in his skype. Still trying to place an order. Just got my service set up. 20B exp and 2 free 1-70. Waiting for the update!